George Dunn was a native of Carnforth and son of Thomas and Mary Emma Dunn of Rainhill Stoops. He enlisted into the Cheshire Regiment, 13th Battalion as soldier W/850 at Wallasey where the recruiting officer was Mr, Greshom Stewart, M.P. for Wirral. In October 1914, the Battalion moved south to Salisbury Plain for training, becoming part of the 74th Brigade of the 25th Division. The Battalion then moved to Bournemouth and then Aldershot before travelling to France on 25th September 1915. After landing at Boulogne, the Battalion moved to Caestre and were bussed to Armentieres. At the beginning of October, they took over the trenches in Sector 90-94. During the next three weeks, the Battalion spent its time in these trenches on the north bank of the River Lys, 3 miles from Armentiere often under fire, with the Le Touquet salient only 40 yards away. When relieved of trench duty the Battalion spent time in Le Bizet and training for gas attacks in Nieppe. It poured with rain for weeks with trenches flooded thigh deep with the sides falling in. On the War Memorial, George is listed as a Bandsman but no official record lists this but if indeed he was one it is likely that whilst in the front line he was a stretcher bearer. Medal entitlement:-1914-15 Star, the British War Medal and Victory Medal. However according to his medal index card his medals were not claimed and after 10 years were broken up. 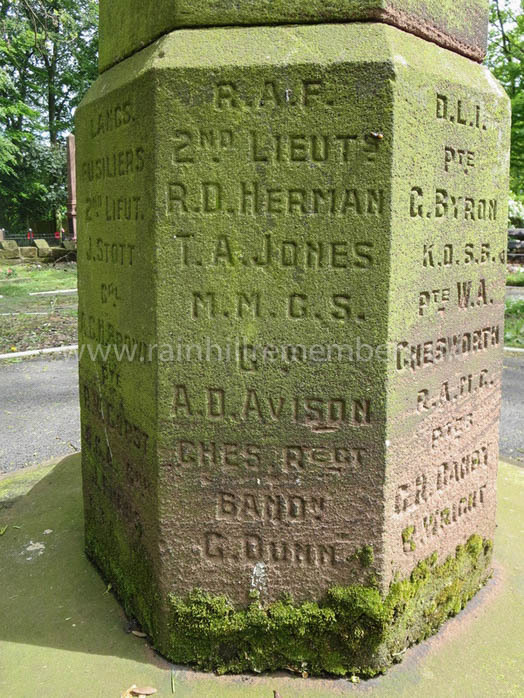 At a special ceremony at the Warrington Road Cenotaph on Sunday 3rd July 2016, Rainhill village dedicated a new plaque bearing the names of 17 men with Rainhill connections who perished during WW1. These men's histories were found during Rainhill Civic Society's research. Rainhill Parish Council funded the plaque and organised the ceremony with Rainhill Civic Society, our local Churches and the Royal British Legion. George Dunn is one of those names. Bandsman George Dunn of the Cheshire Regiment is remembered on the WWI Memorial in At. Ann's Churchyard. Rainhill.